Rotherham United defender Michael Ihiekwe could be on his way out of the New York Stadium permanently if what All Nigeria Soccer is rumouring is true. Currently out on loan at Accrington Stanley, twenty-five year old Michael joined the Millers in May 2017 on a two year deal from Tranmere Rovers, scoring his first league goal in the September five-one home win over Oldham Athletic, which turned out to be his only goal last season. Michael made thirty-five appearances last season in a Rotherham shirt including the two League One play-off semi-finals against Scunthorpe United but didn’t even make the bench for the Wembley Final win over Shrewsbury Town. 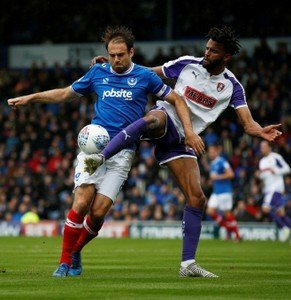 This season he joined Stanley on loan until January and has, so far, played twelve times but the loan might not be extended with reports that Portsmouth are interested in boosting their squad by taking him to Fratton Park. Michael has scored for Accrington this season, his only goal coming late last month – against Portsmouth.